CAN YOU SMELLLllLlLlLllLl ! what, TONY, is, LIFTIN'..
Championship belt doesn't just get dished out to anyone.. The belt gets given to the biggest triumph on max out day.. Tony's max was 435lbs going into last weeks 3 rep max. His progression was showing that 440lbs should have been his 3 rep max attempt so we worked up and threw it on.. 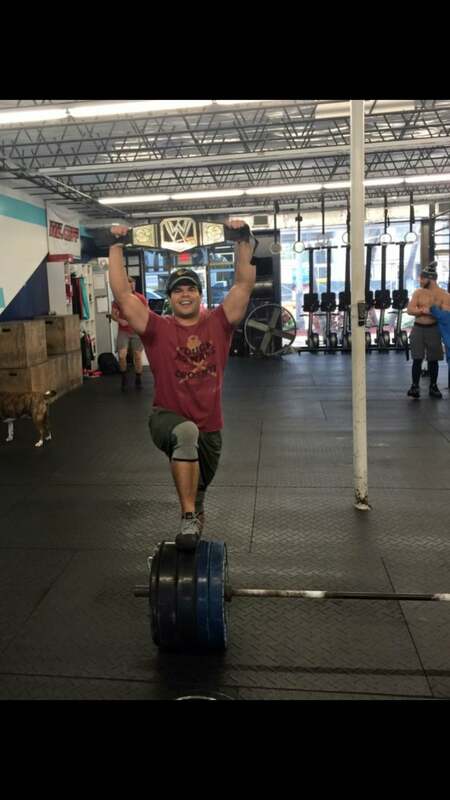 The bar didn't clear the knees for 1 rep last week..
Today, warmups looked goods 405lbs, the form was a bit forward but manageable.. And we jumped to 440 again to punch last weeks lift in the face..
1st attempt ... didn't get 2 inches off the floor because the bar was left a bit out front and became un-liftable..
Told him to go take a walk and focus on pulling that bar into his shins off the floor. 2nd attempt gave it the realest fight of his LIFE. BANG SON 440. That's how you earn the championship belt. Props to tony. We are 2 girls away from having our entire 10 spot female side on the leaderboard deadlifting 300lbs and we added two more to the men's 500lbs club tonight. I believe we are at 17 athletes in hype with 500lbs+ and a few more stragglers close that will bump us to 20+ lifters with 500. So, two wods in one.. How?..Where? ... I don't get it?.. The snatches, are for total weight. The WOD in its entirety is for time.. But, to go super fast on the WOD you would need light weight snatches.. But your score will suffer because your total weight wasn't heavy. So pick your weights for your snatches wisely, and go heavy... but be smart!